As mentioned we went into the woods to clear our heads this past weekend- or at least we went to the edge of the woods- as close as the woods get to the ocean. We were headed to Squamish B.C. to check out future living potential- we have this dream - the Mr. and I to live a quieter life filled with space. 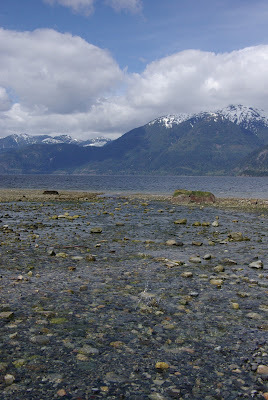 On our day dream adventure we stopped at a Provincial park for some exploring - Porteau Cove- popular with local campers looking for a quick weekend get away from the big city. 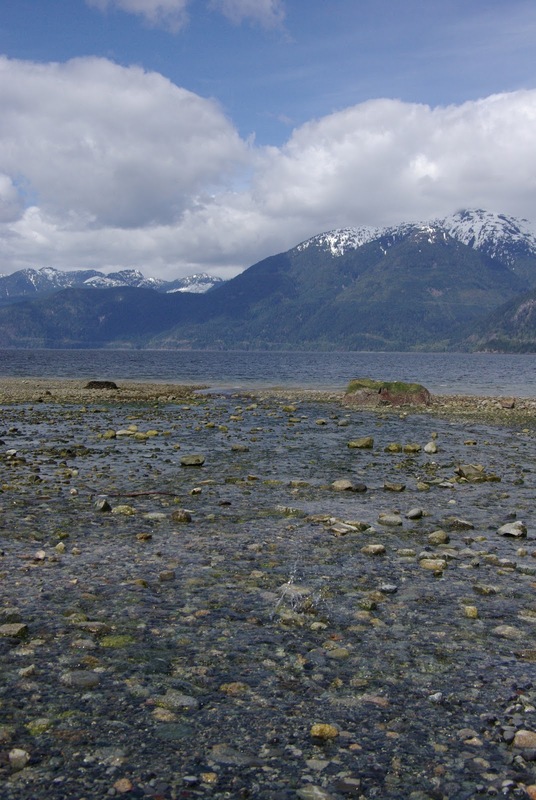 Porteau Cove is a full campground located about a forty five minute drive from downtown Vancouver. Perched on the edge of Howe Sound- on the most southerly fjord in North America Porteau Cove affords spectacular views above and below water- this is also a super popular scuba diving location. Water side camp sites as well as two Olympic legacy cabins provide options for both the outdoors enthusiast and the outdoor observer! As a family with young kids this is quickly becoming a favourite stop to get out and stretch our legs, explore and of course use the bathrooms! Great picnic tables as well as free parking make this the perfect day trip if a longer camp out is not in your plans. I find it amazing that something so peaceful exists so close to such a big city- this is the perfect introductory campground for new campers- get outside people! We went on an adventure this weekend to the place where the mountains meet the ocean- on a skinny strip of beach at the edge of Howe sound- where the hummingbirds danced what can only be their mating dance and a robin searched for worms- sea gulls riding up- draughts and the air throbbing with the sounds of Spring. 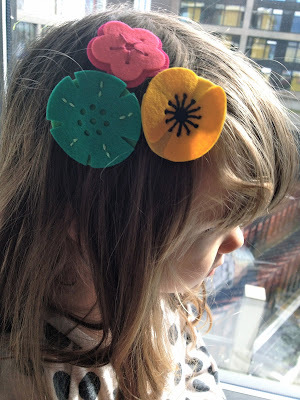 We sat beside a stream and the Littles threw rocks and dug holes while I knitted a few rows in a tiny hat for a friend- each row knitted with love, Spring and sunshine beside a stream at the edge of Howe sound. Sometimes we (as a family) forget that what we need to survive is space and air and quiet- I forget that the sound of water is balm for my soul- instantly relaxing us all. We spent the day dreaming what a simpler life- outside the city- could be like- dreaming of our future- laying plans and writing it in the clouds. Coming home we are all a little changed- a little introspective- more energized- each tiny step we take is together down our path. Hi Friends- I know I already said "Happy Friday" in my post earlier today- but I wrote that post before even venturing outside this morning! 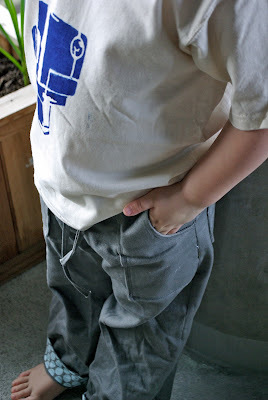 The girlies and I were on our own today- The Boy had his Introduction to Kindergarten that he went to with the Mr. 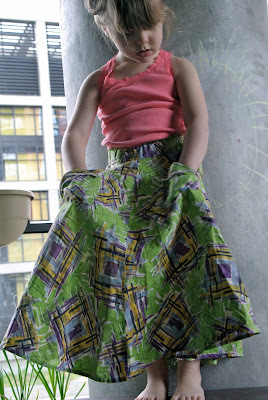 So sans boys we headed over to Robson park for a bit of spring time fun- and errr some fabric from Spool of Thread! I'm walking along- girlies in the double stroller telling jokes and giggling, my back pack is full of fabric and dandelions, my jacket is off and the air is swirling with Cherry Blossoms- magic! We walked all over the fair East side of this city today- ending our journey with a visit to our favourite thrift shop- Community Thrift and Vintage- even more magic was to be found there! Digging through the children's drawer I came across this beautiful, soft fabric in vibrant green and purple- initially thinking it could be sewn up into something else I pulled it out- only to discover an amazing vintage maxi skirt- although I'm sure it is meant for an older girl- it is a maxi skirt on Miss Lo! 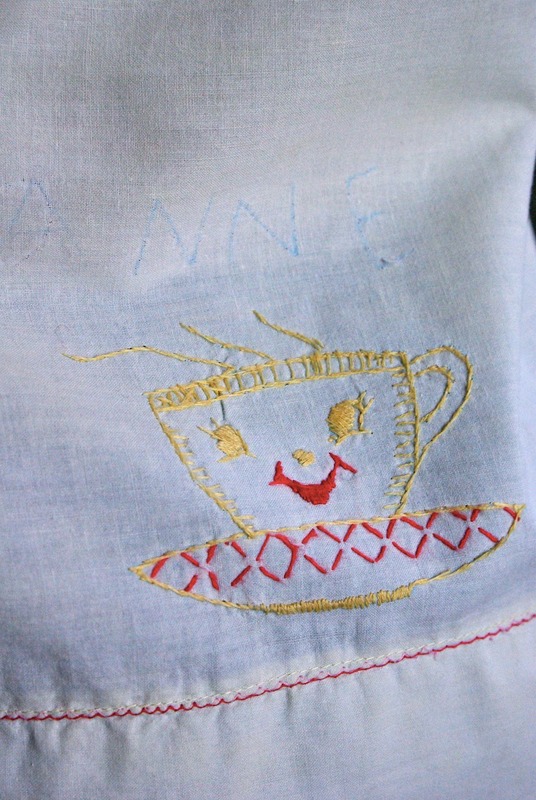 We also scored a beautiful embroidered white on white tunic/ apron top for her as well- the nice thing about vintage is you can interpret it into what ever you want really! 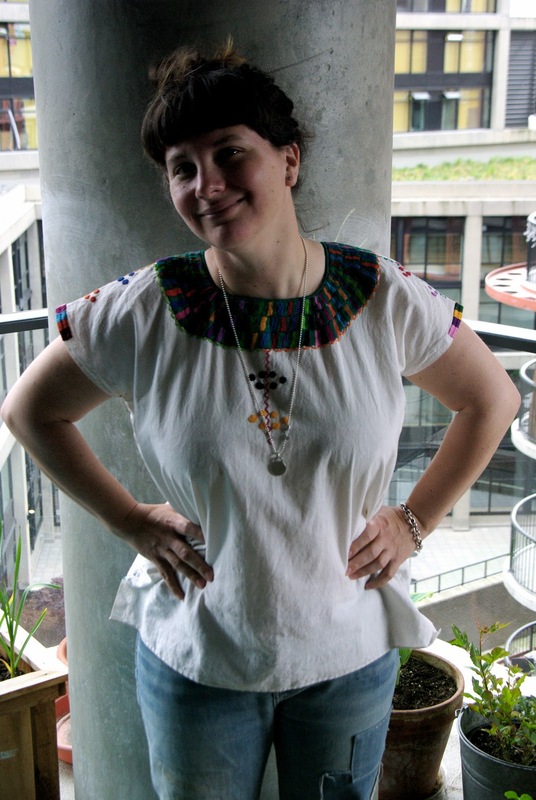 I have been scouring Etsy for a vintage Mexican top just like this one for months now- sturdy fabric with vibrant coloured embroidery! 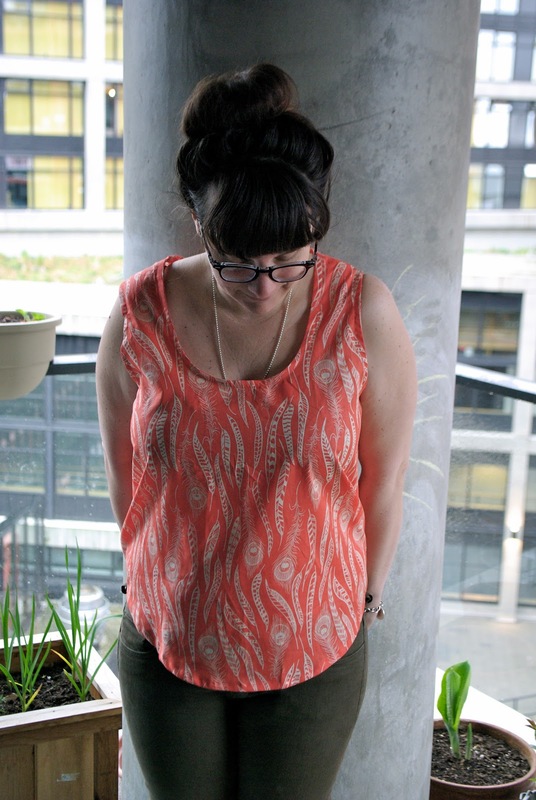 Every top I came across was way over the top- I was looking for something more simple- and this little number at $9 fit the bill and me perfectly! Some days the planets line up just right and everything in the universe just seems to click- today was one of those days- nothing extravagant- just the magic of Spring! Happy Friday Friends- I hope you find some magic today! Kid's Clothing Week day 4- I'm surprised I am still actually interested in sewing! It is usually at this mid way point with any project that I start to lose interest! Here we are though- Thursday was day 4 and I am still going strong- it may be all the amazing inspiration to be found on the KCW blog and Flickr page- or maybe just maybe a tad bit of competitiveness on my part that keeps me moving forward! It is easy to get excited about sewing with all the amazing clothes others are posting- it really reminds me of studio days back in art school when people gather for a collective critique! 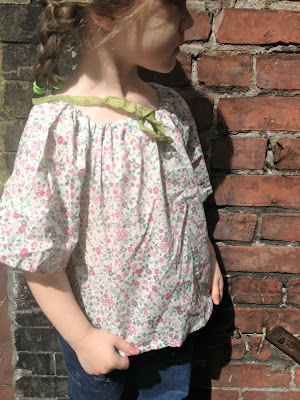 At any rate for day 4 I chose to sew the Ofelia dress from Pattern's by Figgy- such a cute little shape and again an easy breezy, fun dress for Miss Lo to wear this summer! 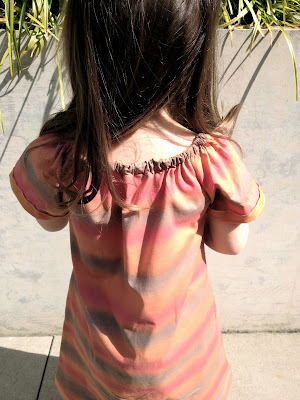 I am not sure what this fabric is as I found it on clearance Boxing Week at our local big box fabric store- I loved the sunset colours and soft texture- while I wasn't sure what I would sew with it I knew this fabric would be something special! This is a great little dress to layer up right now when the weather is not quite warm enough for shorts- I think it looks fab over Miss Lo's jeans! I omitted the ribbon detail that is called for down the front of the dress as again I was going for something simple- but I did trim out the sleeves in a warm orange biased tape that compliments the main dress fabric nicely. 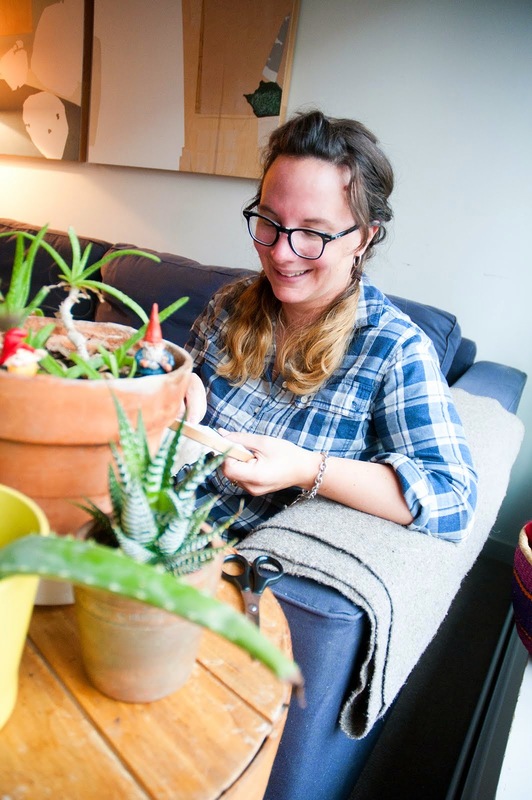 While the over all goal of this week has been to get a jump start on our Spring sewing and offshoot for me has been connecting with some fantastic people- loving all the great blogs I am stumbling across as the week progresses! I love to see so many people sewing such incredible clothing and doing what they love- I think this is the true reward of KCW! Friends it is Friday again! I still have a couple of days of sewing left- I saved a brand new(to me) pattern for over the weekend- I am excited to get started on that! 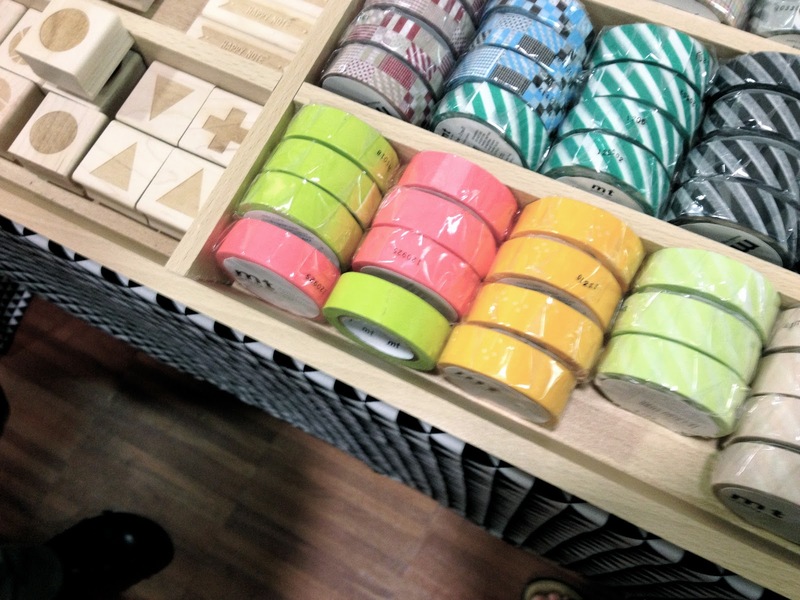 Also if you are local to Vancouver- this weekend is the GOT CRAFT? show and sale that has been moved to Templeton Highschool- if I am not too busy sewing I may swing by- a few of my favourite people will be there including Draw Me A Lion! 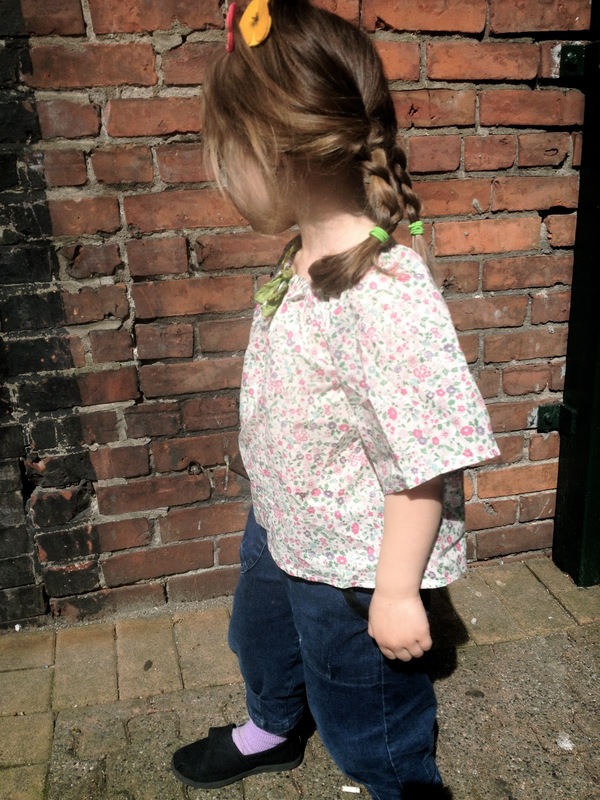 Kid's Clothing Week- day 3- Children's Blossom Blouse from Sew Liberated- one of my favourite pattern and lifestyle books- with 20 great patterns to chose from I have made almost every single one- yes it really is that good! If you are looking for a wonderful handmade book to act as a jumping off point to a handmade life- this is a good place to start- very easy to follow and lovely pictures to inspire! For day 3 I chose to sew the Blossom Blouse- or a version of- I have made several of these blouses for Miss Lo over the years as she grows and love how you can change a basic pattern so many times to create very different looks. Today I shortened the sleeves a tad- omitted the elastic gathering for a more simple and clean look. As necessity is the Mother of invention- ahem I was out of elastic- I made a button hole opening at the neckline and inserted vintage silk ribbon into the neck casing. I love the look of the little drawstring at the neck- paired with the simple sleeves I think this top is very French looking- think Bonpoint style! 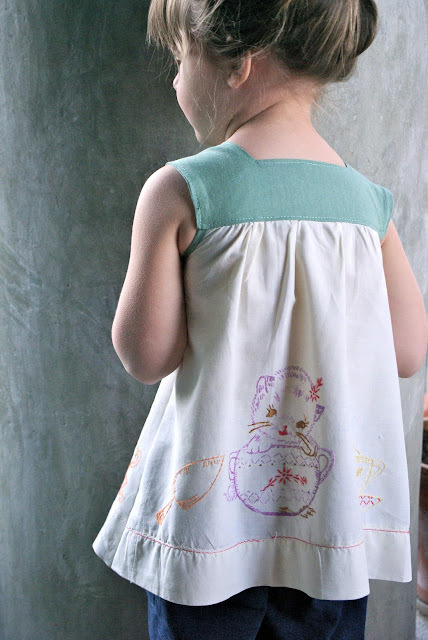 The fabric used is actually Memoire a Paris from Lecien- beautiful soft printed cotton from Japan- very reminiscent of the smocks and nightdresses my Mom sewed for my sister and I in the 70's- really innocent and childish- perfect for the coming months of warm weather when we want to be cool but not let the sun touch those perfect little shoulders! Day 2 of Kid's Clothing Week and it was decided that The Boy needed some new shorts- this in it's self is nothing new- this kid is growing like a weed and always needs new pants! 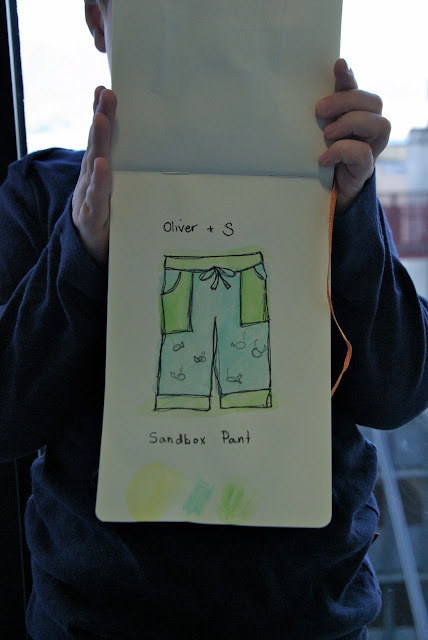 I think I have sewn this pattern- Oliver & S Sandbox Pants- three times already for him in the past few months- blogged about here and here. 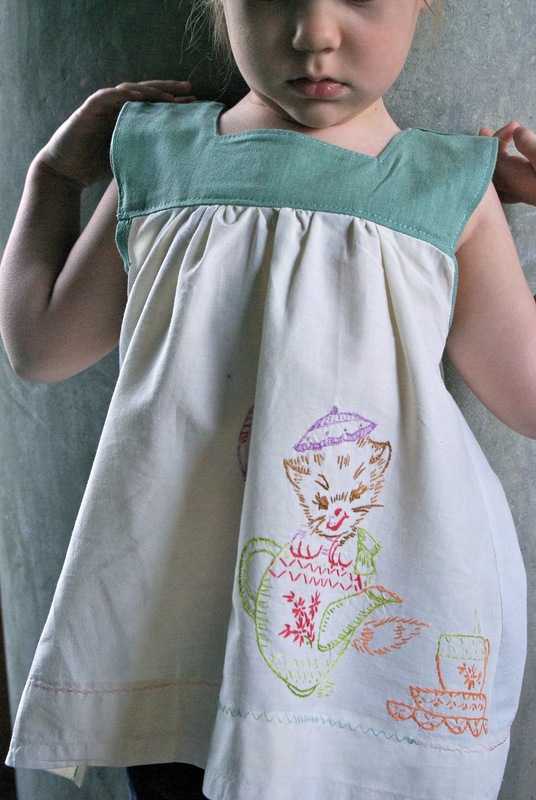 To say it's a favourite of both the sewing Momma and The Boy would be an understatement- this pattern is simple and straight forward with fantastic details like the pockets and draw string! With the temperatures steadily inching consistently towards 20 degrees I decided to make this pair into shorts- or as we used to call them back in the day- which was also a Wednesday- "Jammers"! 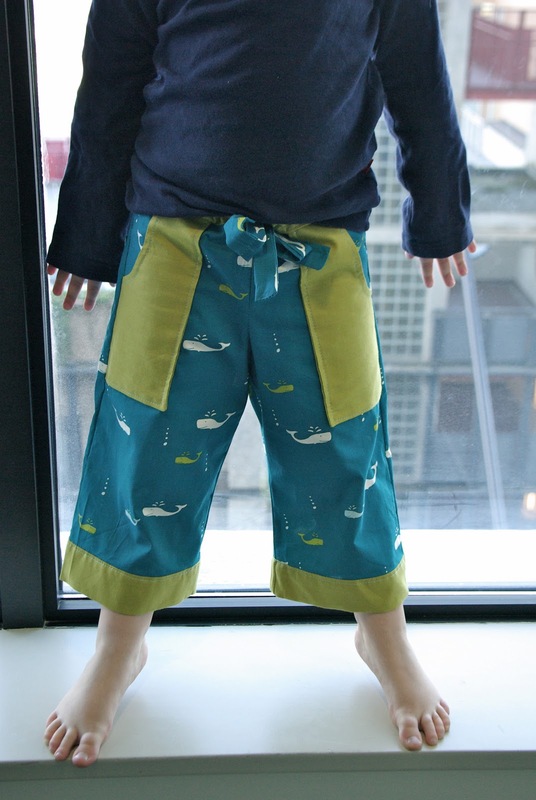 The Boy spotted this great whale fabric at Spool of Thread a few weekends ago- it is Set Sail for Birch Fabrics- lovely soft organic cotton in a great teal shade- accented with a pop of green organic cotton at the cuffs, pockets and waste band. Because this is technically a full length pants pattern all I did was shorten it by about six inches and then add the contrasting green cuff- which finishes the leg off nicely. 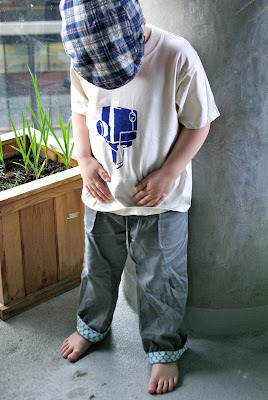 It can be really tough for me to sit down and sew for my boy- the patterns aren't as fun and neither are the fabric choices ( as patterns for the gals)- I am so glad that Spool of Thread is such a great resource in Vancouver- carrying not only inspiring boy's patterns but also tonnes of "masculine" fabric selections that my boy totally digs! When I'm working with great products it is easy to get carried away and want to keep sewing more- hence I have another pair of the Sandbox Pants cut out in a super sturdy brown twill for another day this week! Yesterday - which was Monday- was the first day of Kid's Clothing Week- for those of you needing to catch up... 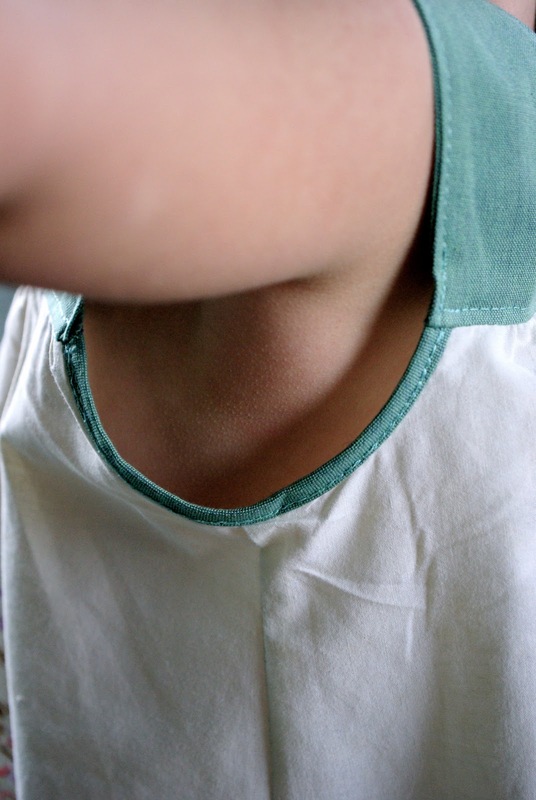 Kid's Clothing Week is an online challenge where in the participants pledge to sew for at least an hour a day for the next seven days. The idea is to get a jump start on that growing stack of kid's Summer clothes that we all have lurking in our sewing room! For my first project I chose a fairly easy McCall's(M6022) pattern- and while I had not made this configuration before I have sewed other tops out of the pattern- so I was pretty familiar with the construction and everything came together fairly quickly. 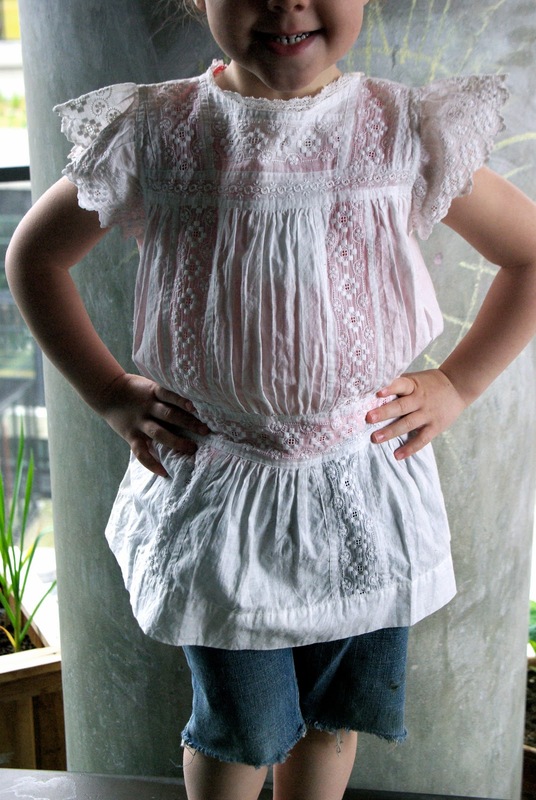 The fabric I chose was this sweet little vintage table scarf that I picked up at Community Thrift & Vintage a while ago- hand embroidered and washed so soft this has turned into the perfect Summer top for Miss Lo! Accented with some organic teal blue cotton at the yoke and bias- the blue is a soft wash that nicely compliments the vintage embroidery. 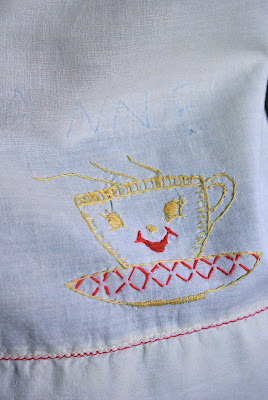 Not only was yesterday the first day of the sewing challenge it was also Earth Day- so I thought I would start things off by re-using this little vintage pretty. I love breathing new life into something that others may think to be obsolete- giving a wee girl a soft new top- perfect for a Summer day! It's Monday- again! I really feel that long weekends should happen at least once a month- bare minimum- regular weekends are way too short! This weekend was no exception- I hosted a clothing swap on Friday night which was fantastic- new and old friends coming together and each of us leaving with fun "new to us" additions to our wardrobes. Saturday we attended what was quite possibly the cutest and most well considered 1st birthday party ever held- dinosaurs, marshmallow pops and cupcakes- a good time was had by all. That brings us to Sunday and the Make It! craft show- held in the Spring and Fall this was by far the funnest craft sale I have ever attended- and I have done my fair share of sales. This was a field trip for the Mommas and I enjoyed every second! Held at the Croatian Cultural Centre on Commercial Drive this renegade revolution was not to be missed- music to entertain us while we shopped, demonstrations by Bird On A Wire plus some of the best vendors in Vancouver. I will fully admit it that as a maker myself I often go to craft shows seeking ideas and inspiration- it is always a pleasure to chat with other makers and learn their methods- this time I not only gathered inspiration and connections but also loads of super cute indie goodies! As with any show or sale there is a lot of the same stuff- lots of screen printed t-shirts, lots of jewelry and lots of handmade body care products- it is always nice to see artists being original and trying to hard to make a living doing what they love in such a competitive market. A few real standouts in the crowd were the rice babies- beautiful peg dolls, fait pour toi- lovely handsewn dolls and mubiblossom- a real standout- Miss Lo has several of their new hair clips and will possibly be wearing them to bed tonight! I always walk away from sales like Make It! full of energy and pirated good vibes- the mood is infectious and everyone is having a good time. 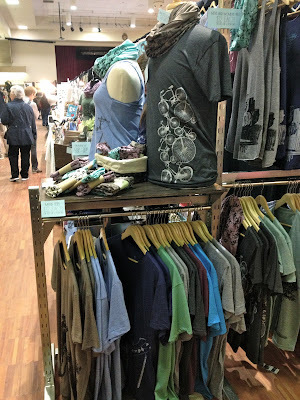 The vendors really put their hearts and souls into weekends like this and the items brought home have most likely been made with love by the person who sis selling them- the intention and good vibes follow are palatable- this was an excellent way to wrap up my weekend! Good Morning Friends! 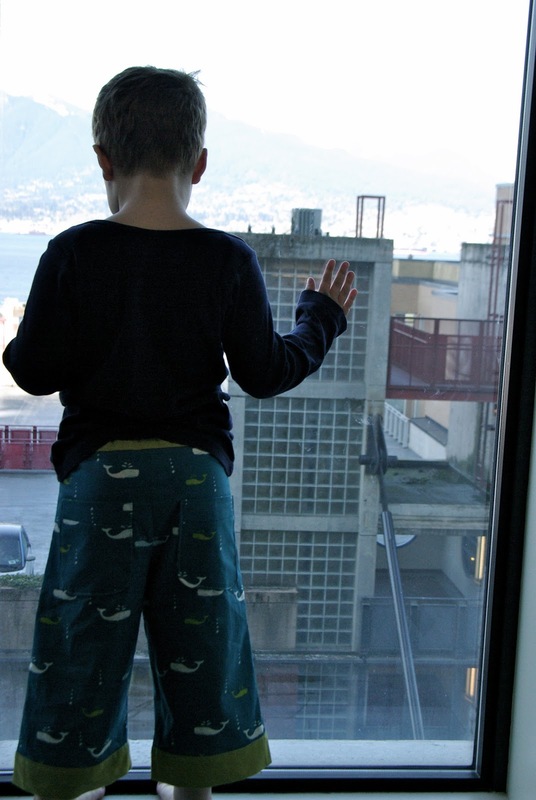 It is Friday again- dreary and rainy out in our neck of the woods- the Littles are staring out the window like some little forlorn forest animals who are trapped inside! I am happy for the respite as I have so much to do that is getting neglected in this apartment of ours! So we are taking today and tucking in- a movie and games day for the little ones and a chore day for the Momma- cause it's gotta happen one of these days! Yesterday after a great visit from friends I was inspired to start some new work- I haven't painted for myself or really any non-commercial work in about a year! This was just me sitting and playing with my paints- I was a bit surprised at the colour pallet I chose to work with but tried it out and am warming up to what is happening on the canvas. So this is just a sneak peek- when I'm done I will share the final pieces! Happy Friday Friends- Happy Earth Day- get outside rain or no rain- laundry or no laundry! May your mugs be full and your feet be dry! P.S. I am going to steal some time away from chores and paint some more today- this is just too good! As previously mentioned last weekend found me at one of my favourite little fabric shops in Vancouver- Spool Of Thread- conveniently located just behind Robson Park. So while the Littles played in the park with Daddy I had a really good gander at all the new goodies in store- this is why I say the park is just plain convenient! I was thrilled to immediately spot the Wiksten tank pattern as soon as I walked in the door- I have been contemplating ordering this online but just wasn't sure how it would sew up & look on my frame- seeing it live in the store (sewn in a similar coloured fabric) made up my mind- this was the perfect summer pattern for me! Especially once I spotted the new Anna Maria Horner rayon fabric in this great coral shade- that fabric had me at hello! 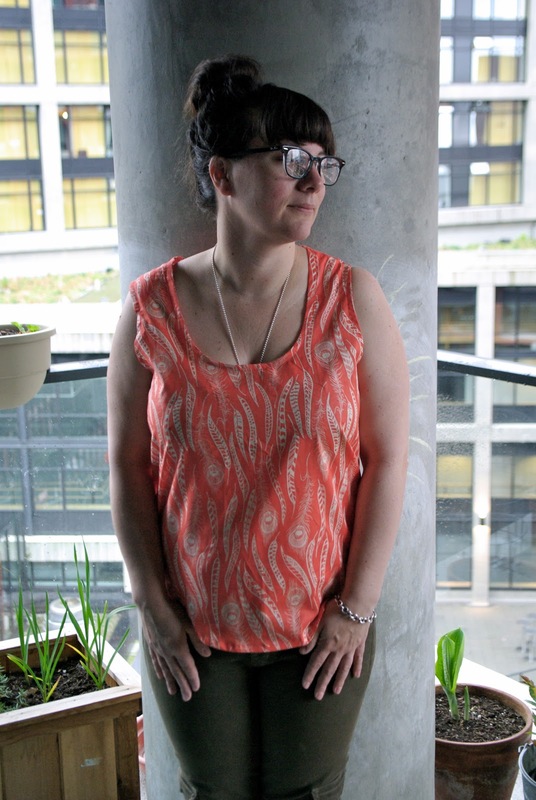 This pattern sewed up so quickly and easily with simple, clean French seems- I feel this top can go from dressy to casual depending on fabric choice- I will definitely be making more in the near future. 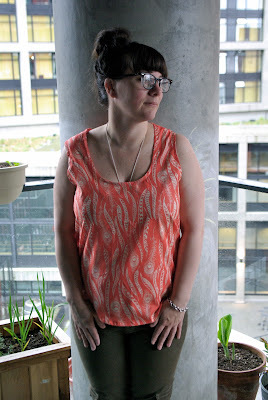 While the pattern was a bit of an investment I feel it was worth the splurge- I love the lines of this tank and the aforementioned ease of construction- this tank seriously took me an afternoon (full of demands from the Littles- read many interruptions!) to finish- the instructions are clear and concise. When I think of Summer dressing I think of easy, breezy, comfortable and simple- that is exactly what the Wiksten tank brings to the table! Now to get back to Spool Of Thread for more fabric! 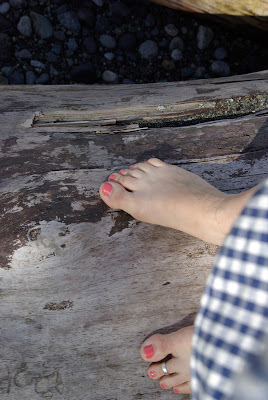 P.S.- Summer also means renewing my love of painted toe nails- nicely matching my top! There are flowers of a different sort popping up in our garden these days- in the form of these pretty cushions on our chairs. I know this is not earth shattering news or even all that interesting of subject matter but since I spend a lot of time out on our deck now that warmer weather has arrived I am pretty happy with these cheery blooms! Originally the cushions were black and were stock to the Ikea chairs- there was a lot of black and grey happening out on the deck and I thought a pop of colour would do the trick. Using this awesome fabric from my stash I recovered the black cushions- using the original cushion as a template tracing it out and then just sewing a snug cover. I took the liberty of adding ties- which aren't really necessary but look really cute- I think! So bring on the sunshine! I will be out on my deck- puttering in the garden and sitting pretty on a bed of flowers! Now for the rest of the deck- get rid of the old orange carpet, paint the table, buy more potting soil....this is going to be a busy weekend! I have discovered the deal with five year olds is that once you even vaguely mention something in passing they latch onto what you have "promised" like a dog with a bone. So when The Boy came to me this past weekend with my Ed Roth stencil book and I mentioned that maybe we could make a t-shirt together "one day"- he immediately decided that "one day" was Monday. 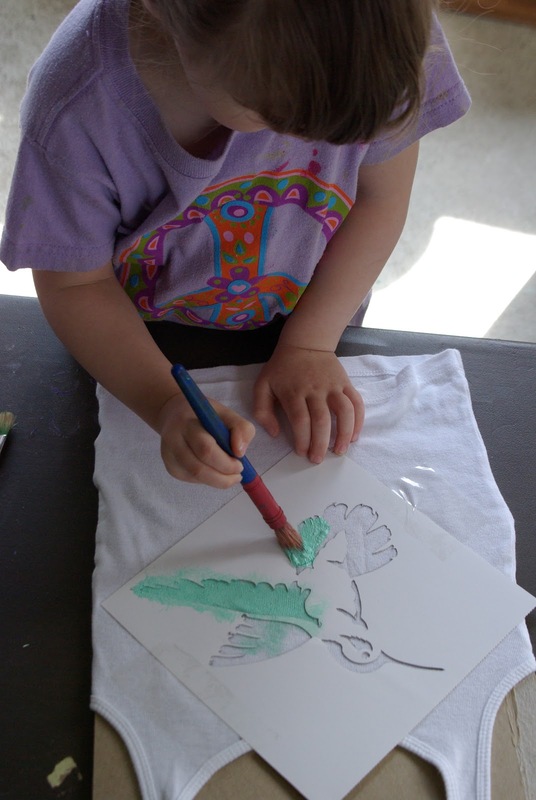 Which is how I found myself stenciling up a storm with the Littles in a patch of sunshine on Monday afternoon! Step 1: slide a thick piece of cardboard between the front and back of t-shirt, this will provide a solid surface to work on- keeping the shirt from shifting around as well as create a barrier to prevent any ink from leaking through to the back of the t-shirt. Tape stencil in place using regular packing or masking tape- Scotch tape is too flimsy. Step 2: using a small amount of ink load up your brush- you don't want too much ink on the brush as that will cause a blotchy design. This is more of a "dry" technique and you can always go back and add more ink later. Tap or- as the technique is commonly known as- pounce the brush against the stencil's cut out areas. Note- if this was my project I would work from the outside of the stencil in- covering the edges and working in towards the centre of the stencil- however each person has their own technique! Step 3: once the stencil area is completely filled in carefully remove the stencil- let your t-shirt dry for about a half hour before heat setting with an iron. To heat set place t-shirt of ironing board with cardboard still inside- place another piece of paper or paper towel over top of image- iron over the area with the image for about five minutes to ensure your image is set and will with stand laundering. 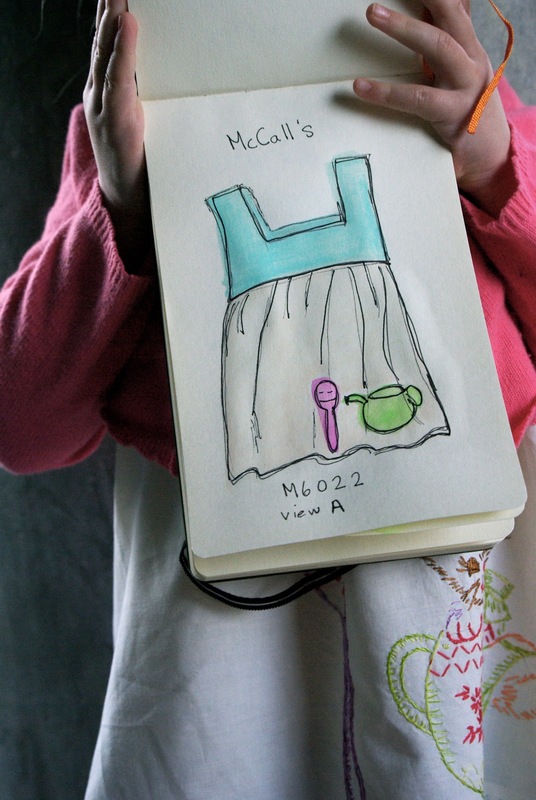 This is a super fun and easy project- a really nice way to personalize your wardrobe and make it more interesting! 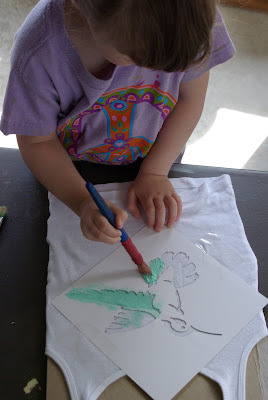 A quick word about clean up- fabric ink is pretty permanent- even if it is not heat set- be sure to wear "art clothes" and wash your brushes as soon as you are finished- lay your stencil flat and wipe with a damp cloth. Also if you have white furniture or carpet this might be a good outdoor project! 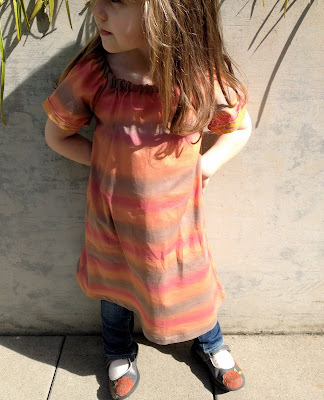 In other news I am gearing up for Kids Clothing Week next week April 22- 29- an online community event where in the participants commit to sewing kids clothing for an hour each day for a week. Only an hour a day- this is going to be fun and easy. I thought I would get inspired this week and sewed up a pair of Sandbox pants for The Boy- yes they are a bit crumpled in the photos but that is because he has worn them non stop all weekend- save for a minor repair on Friday! 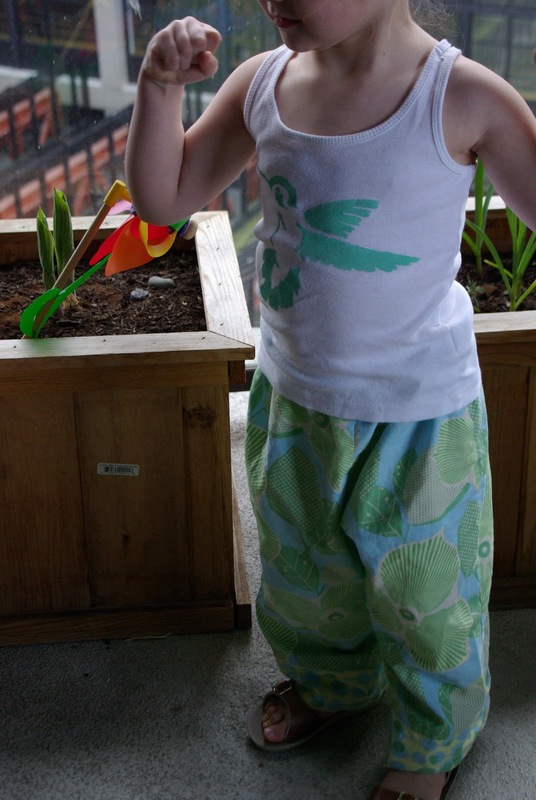 Miss Lo is sporting an easy, breezy pair of cotton "relaxing" pants- no real pattern here just some really pretty Amy Butler fabric- her new humming bird tank and Salt Water sandals complete her outfit! Be prepared for loads of sewing posts next week- feel free to jump in and share your own projects I would love to hear- if you blog and are sewing kids clothes next week please post a link in the comments area so we can all see what you are working on. I'm feeling very inspired by all the awesome images being pinned on the Kids Clothing Week Pinterest albums- the trick is now for me to focus and not get too distracted by all the pretties!